Doby Verreloc’s new EasyFit Tabbed Access Doors offer the ideal solution for fast, safe and effective access to ventilation and air conditioning equipment mounted within ductwork, such as fire and volume control dampers. 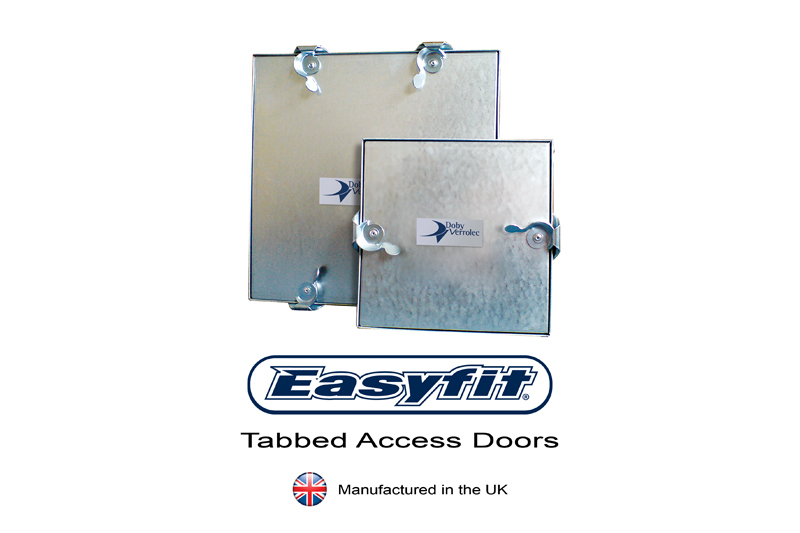 Manufactured in the UK, EasyFit Tabbed Access Doors, cam locks and locking brackets are formed using Z275 galvanised steel and the doors are insulated with high density glass wool. The riveted box construction underlines the rigidity of the package, minimising the potential for door failure. Unlike some other manufacturers, Z275 steel is used across all components, which means that the risk of corrosion, leakage and failure, as well as any replacement installation costs is heavily reduced. Conventional duct doors may likewise be formed of Z275 steel but the associated cams and locking brackets are often much lower in coating weight. When it comes to inspection, maintenance and duct cleaning purposes, Doby Verreloc’s Tabbed Doors are quick and easy to install as no sealant or extra fixings are required. What’s more, the Access Doors are fully compliant with the BESA DW144 standard and are available in a variety of sizes.